I have a pressing fashion question. 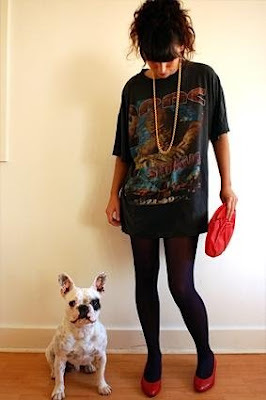 Am I too old to rock an oversized vintage tee? Because H-town has some really good ones. Uh, I doubt it. I think a big old tee paired with some super flattering jeans and some kick around shoes (all within basic parameters of au courant style of course...but I don't have to tell YOU that!) is my favorite look right now. And if that shirt belongs to your honey, well, all the better. Yay! I was secretly hoping *you* would answer my burning question. pretty much... NO. wear them (the Ts) proudly. Will you guys come over and help me clean out my closet? In case you were still in doubt: N.O. I know it's cliche, but it's all about attitude and confidence. I couldn't pull off this look regardless of my age, but I've seen many people who can...regardless of their age. I still wear an oversized tee out and about and actually get compliments. I won't even tell you how old I am but here's a hint: I remember watching the Beetles on Ed Sullivan. Pants are going to be key to the ensemble, agreed, but that has nothing to do with age. Of course you're not. And I quite like the no pants look, but maybe that's because I'm about 12.